Any electronic device generates heat and with increasing performance the heat development increases. If the heat is not sufficiently dissipated this can lead to an overheating of the device up to a complete system failure. 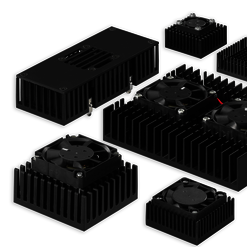 Heatsinks accept the thermal management of electronic devices. 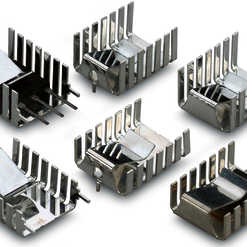 Heatsinks are made of good thermal conductive material such as aluminium or copper. They increase the surface over which the device can emit heat. Therefore the temperature can be reduced and an overheating as well as the resultant damages can be efficiently prevented. The effective heat dissipation by means of heatsinks helps to avoid possible system failures. At Fischer Elektronik you can receive the heatsinks directly from the manufacturer. 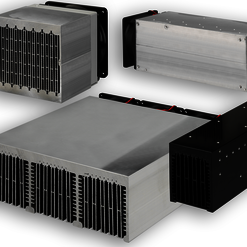 All heatsinks can be delivered optionally with mounting material. 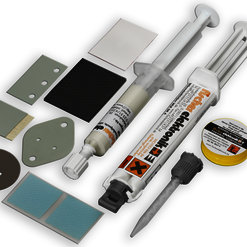 We supply standard devices in different sizes, designs and installation variants. 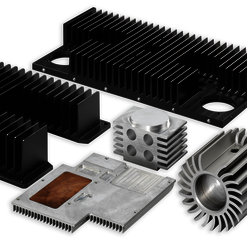 Beginning with profile- and fluid heatsinks over fan coolers and finger shaped heatsinks up to heatsinks in round, flat, angled or lamella form. We also have special LED heatsinks for LED operated lights in our range. On request we manufacture special formats according to your individual demand.